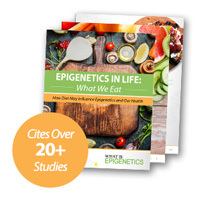 A Child’s Mental Fitness Could Be Epigenetically Influenced by Dad’s Diet | What is Epigenetics? We often think that taking supplements is a good thing – but what if we consume too much? And could doing so negatively affect our children? Researchers from the German Center for Neurodegenerative Diseases (DZNE) found that fathers who consumed an excessive amount of certain supplements could epigenetically harm their offspring, affecting their children’s memory and learning ability. As we know, a mother has profound impact on her children and their development. Epigenetic research has shown that mothers can influence epigenetic marks on their offspring’s DNA, changing how they react to stress, whether or not they grow up healthy, and their ability to learn, remember, and adapt as adults. We are now only recently uncovering the epigenetic role that a father plays in his baby’s health and wellbeing, including epigenetically giving his children high blood sugar and increasing his daughter’s risk of breast cancer. According to new research in Molecular Psychiatry, fathers who consume an excess of certain sources of methyl donors can impact genome-wide DNA methylation marks and adjust gene expression in their children. In a mouse study, when dads were on a diet rich in folic acid, methionine, and vitamin B12, their children did not perform well in memory tests and their gene expression reflected this change. “For a long time, it was assumed that these paternal epigenetic marks are erased completely after the fusion of sperm and egg cell,” explained Dr. Dan Ehninger, who leads a research group at the DZNE’s Bonn site. However, now we know that some paternal DNA methylation likely survives this process. Ehninger’s team, along with colleagues from the Federal Institute for Drugs and Medical Devices and the Helmholtz Zentrum München, examined epigenetic adjustments in male mice. They wanted to find out if these changes were linked to cognitive differences in offspring. First, they fed the male mice either a normal diet or a diet rich in methyl donor and cofactors necessary for methyl group metabolism, including methionine, folic acid, betaine, choline, vitamin B12, and zinc. The mice were mated after six weeks and the researchers assessed the offspring’s epigenetic patterns and cognitive abilities based on their performance in a few mental tasks. Overall, they found that the offspring of the mice fed the diet rich in methyl donors did not perform as well in learning and memory tests. “We were able to show that even a transient change in the paternal diet can cause impaired learning skills in offspring. This affected in particular the ability to properly learn a spatial navigation task,” said Ehninger. Not only did the team find abnormalities in the mice’s behavior, but the nerve connections in a part of their brain crucial for memory – the hippocampus – reacted slowly to electrical stimuli. This demonstrated weak neuronal plasticity, or poor adaptiveness. Furthermore, Kcnmb2, a gene connected to neuroplasticity, was downregulated in the offspring of fathers who ate an abundance of methyl-donors. Although these results come from an animal study, humans may also consume high amounts of methyl donors, according to Ehninger. For instance, many products in the United States are fortified with folic acid. Consuming too many energy drinks containing vitamin B12 or take folic acid pills could have an epigenetic impact that is passed to the next generation to some degree through the sperm. Many people are also beginning to try epigenetic supplements. It is crucial to be cautious and careful about what we eat and try to understand the ways in which our diet may epigenetically impact more than just our health, but also the health of our children. Source: Ryan, D.P. et al. (2017). A paternal methyl donor-rich diet altered cognitive and neural functions in offspring mice. Molecular Psychiatry, 00:1-11. Reference: Laboratory Study Shows that Paternal Nutrition Affects Offsprings’ Mental Fitness. DZNE. 4 Apr 2017. Web.